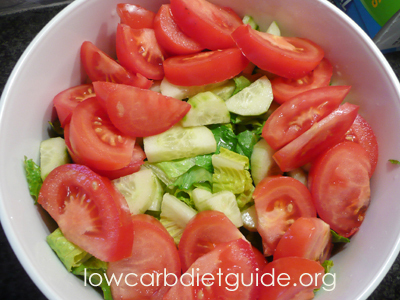 There is a plethora of tasty and healthy lunch recipes for people on a low carb diet. You can either cook your favorite meals differently as to fit them into your plan or you can find recipes that are developed to suit the requirements of a particular diet. You can also find good plans to follow, with recipes for breakfast, lunch, and dinner. If you are on the Atkins diet, you can choose from hundreds of healthy lunch recipes. You can prepare beef stew, chicken salad, or cream cheese and salami roll-ups. If you live on packed lunches at work, you can use a thermal lunch box to pack your lunch. You can put deli ham and lettuce, hard boiled eggs, sliced cheese and anything else you like. You can have soda, tea, and decaf coffee with your lunch. Salad is an excellent choice if you are on the Atkins diet. You can have green salad with cheese, red onion, and chicken. Sprinkle with a low carb dressing or olive oil. Other healthy lunch recipes include Buffalo wings with dip, chicken salad with blue cheese and cucumbers, and beef and mushroom skewers. The Zone diet is easy to follow if you come up with delicious meals. You can choose from a variety of lunch recipes that combine seeds, nuts, vegetables, and meet. Avoid sugar and starchy vegetables. At lunch, you can have grilled chicken salad, tuna steak with vegetables, or chicken kebab. People with busy work schedules can either bring packed lunches (with leftovers from dinner) or they can order a packed meal from a diet meal delivery service. There are services that deliver meals daily, and dieters can choose from hundreds of tasty lunch options. People are offered meals such as turkey meatballs with vegetables, beef casserole, tomato and mushroom omelet, and many others. Packed meals are offered for many low carb diets, including the Zone, Atkins, South Beach diet, and others. People on the Paleo diet can choose from Paleo-compliant lunch options. They can order grilled steak with vegetables, BBQ shrimp salad, or turkey meatballs in marinara. Those who prefer to eat homemade food can choose from a large list of allowed foods. These include meat from animals on an organic diet, seeds and nuts, eggs, and vegetables. There are plenty of recipes to prepare using foods from different food groups. You can have steak with mushrooms, stuffed pork tenderloin, or shrimp and mango salad. Oils such as coconut, nut, and olive oil are allowed. The GI diet offers a different approach and emphasizes eating foods with low GI. If you are on the GI meal plan, you can have foods such as homemade soups, sandwiches with veggies and low-fat mayonnaise, meat ravioli, etc. Low GI foods include vegetables such as lettuce and broccoli and staples like wheat tortilla and brown rice. There are plenty of recipes to include in your weekly menu, and they are suitable for both special occasions and casual lunch menus. You can have cheese mushrooms, crab-stuffed avocados, or Italian-style beef stew. Some weight loss management services even create diet profiles as to prepare the best meal plan. Dieters answer questions about their weight, height, age, desired weight, body type, and preferred meal plan. They are asked whether time, money, or portion control is the biggest challenge to losing weight. Whether you want to have a meal plan prepared for you or plan to create it on your own, there are plenty of lunch options for a low-carb diet. You can adapt recipes to suit your requirements or stick to tried recipes with organic fruits and vegetables, lean meats, and other healthy products.